With over 30 years as an emergency responder, Richard Brooks has seen more than his share of people in danger—from fires, suffocating plumes of smoke and ash, spreading puddles of unknown noxious liquids and more. No matter how low or high-tech the approach to such emergencies, he says the challenge first responders always face is how to react quickly and correctly. WISER (Wireless Information System for Emergency Responders) is the first in a trio of disaster-response tools, developed by the NLM division of Specialized Information Services. The tools are dramatically changing how local, state and federal officials, and emergency response personnel internationally, handle hazardous materials spills, radiation or chemical events and even possible terrorist incidents. “These are tools we hope never have to be used. But if they are, they must provide the most reliable, validated information available,” says Pertti (Bert) Hakkinen, NLM’s Senior Toxicologist and Toxicology and Environmental Health Science Advisor, who also leads the WISER project. WISER provides quick and easy access to information on hazardous substances. It was launched in 2004 for use on PDAs (personal digital assistants) and was one of the first mobile products to literally put information in the hands of emergency responders. The second in NLM’s disaster-response triad is REMM (Radiation Emergency Medical Management). Introduced in 2007, it offers guidance to healthcare professionals on diagnosis and treatment during radiation events, says Captain Judith Bader, MD, USPHS of the National Cancer Institute (NCI). She and Captain Jeffrey Nemhauser, MD, USPHS of the Centers for Disease Control and Prevention (CDC), are the managing editors of the REMM Web site. Florence Chang, chief of the technology team, develops REMM tool enhancements for the site and for mobile users. The third tool, CHEMM (Chemical Hazards Emergency Medical Management), a project also led by Hakkinen, is now in development and due for initial release by the end of 2010. “The WISER, REMM, CHEMM suite of tools provide quick access to reliable, accurate HazMat and CBRN (Chemical, Biological, Radiological, Nuclear) information for the emergency preparedness and response community,” notes Stacey Arnesen, head of NLM’s Office of the Disaster Information Management Research Center (DIMRC). “WISER is oriented for emergency responders at the scene of an incident. REMM and CHEMM assist emergency responders at the scene and first receivers at the hospital to make informed decisions about acute and long-term medical care,” Arnesen adds. WISER and CHEMM utilize information from NLM’s Hazardous Substances Data Bank (HSDB®), a database on the Toxicology Data Network (TOXNET®) which contains comprehensive toxicity, safety and handling, environmental fate, and other information on over 5,300 hazardous substances. In addition to the NLM sources, they use validated data from other radiation, chemical and biological information resources. These tools are accessible as Web sites and available as software downloadable to mobile devices and PCs. Most recently added are the WISER and REMM apps for the iPhone and iPod touch and mobile WISER for the BlackBerry smartphone. 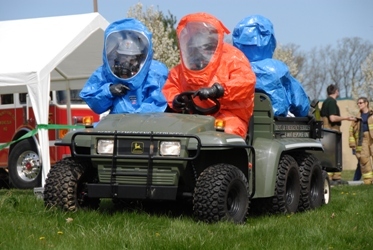 As Chief of the CBRNE (Chemical, Biological, Radiological, Nuclear, Explosives) Expert Branch in the Division of Preparedness Planning in the US Department of Health and Human Services (HHS), John F. Koerner focuses on dealing with potential high-casualty disasters. The NLM disaster-response tools display evidence-based information, and everybody gets information tailored to their role. For example, an EMT worker might focus on quickly preparing victims for transfer to a hospital, while the nurses and doctors at the hospital are looking at length and level of exposure to help them determine appropriate treatment. Photo Caption (top photo): A drill performed by the Hazardous Materials Response Team, part of the Department of Emergency Services in Cecil County, Maryland. The team responds to incidents involving hazardous materials that could threaten the health and safety of citizens. Photo courtesy of the Cecil County, Maryland Department of Emergency Services. 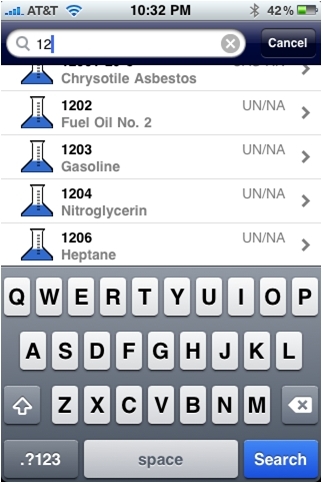 Photo Caption (middle photo): A view of WISER for the iPhone/iPod touch, which provides full access to WISER’s database of chemical, biological, and radiological substance information.